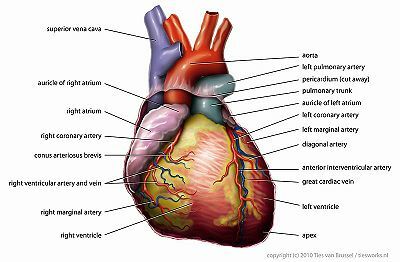 The atrium's (singular of atria) meaning is the entrance, and the ventricle's meaning is the belly. Thus, the two atria are the entrances to the heart and two ventricles are bellies of the heart. After the two atria receive the chambers, two ventricles discharge the chambers. Some large veins like pulmonary veins, the superior vena cava, and inferior vena cava bring blood into the heart. The right and left atrium are separated by the muscular wall they both share which is called the interventricular septum. The right atrium leads the blood to the right ventricle by the right atrioventricular canal which helps to regulate how blood flows through the canal. 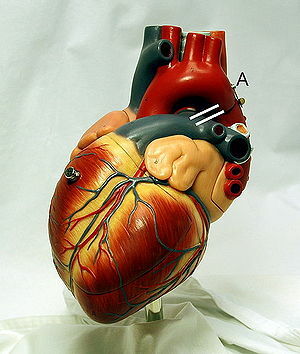 Blood from the left atrium is separated by the left atrioventricular valve which helps to open valve in various response. The papillary muscles usually connect to the valve via chordae tendineae. Blood flows down to the left atrioventricular canal and the left ventricle. After that, all of the blood in the left ventricle flows out of the aorta, which only flows in one direction. At first, it enters the left atrium. It then travels into the left atrioventricular canal and the left atrioventricular valve. After that, it enters into left ventricle, passing through the aortic semilunar valve and exits the aorta. After the blood comes back from the inferior vena cava and the coronary sinus, it travels into the right atrium, the right atrioventricular canal, the right atrioventricular valve, and right ventricle. And then it passes through the pulmonary semilunar valve and the pulmonary trunk. After that, the blood just goes to lungs again. It is the heart coronary artery blockage. Coronary heart disease is that plaque which consists of cholesterol, fat, and other things. It builds up in the coronary arteries. When it is in that situation, it is hard to get blood back to their heart muscle. It can be caused by a heart attack or other serious problem. Coronary heart disease is a very affective disease, that can affect both men and women. Many people can prevent this disease by maintaining and regulating their life style. Cardiomyopathy is a heart muscle disease. There are two different types of cardiomyopathy: extrinsic cardiomyophathies and intrinsic cardiomyophathies. Most cardiomyophthies are usually extrinsic cardiomyophathies. Extrinsic cardiomyopathies is disease that outside of the myocardium. Intrinsic cardiomyopathies is a disease that causes weakness of the muscle of the heart. Dilated cardiomyopathy(DCM)- There is a problem with the heart's pumping funtion. Hypertrophic cardiomyopathy (HCM)- There is a problem with the heart's muscle. Noncompaction Cardiomyopathy- There is a problem with the heart's left ventricle wall. Restrictive cardiomyopathy (RCM)- There is a problem with the heart's ventricle. Hypertension is the high blood pressure in the heart. There are various treatments for heart disease. People who have heart disease should change their lifestyle. Nowadays, many people don't exercise due to their busy life. Although many people usually eat vitamins or minerals for their health, it is better to exercise regularly at least 30 minutes every day to prevent heart disease. Moreover, people who have heart disease should reduce their intake of fat and sodium. If it is not enough, they should go to see a doctor. The doctors may make your heart better. There are few more options like surgery or other medical procedures. ↑ Human heart Wikipedia, Wikimedia Foundation, 9 May, 2011. ↑ Structure of the Human Heart Unknown, The Franklin Institute, 2011. ↑ Heart Blood Jennifer Heisler, About.com, August 06,2009. ↑ Heart disease definition Mayo Clinic Staff, Mayo Foundation, 12 January, 2011. 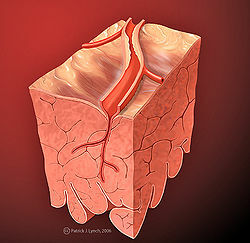 ↑ What Is Coronary Artery Disease?National Heart Lung and Blood Institute, February 2009. ↑ 7.0 7.1 7.2 Heart disease Wikipedia, Wikimedia Foundation, 26 April, 2011. ↑ Heart Disease TreatmentsMayo Clinic Staff, Mayo Foundation, 12 January, 2011. The Vertebrate Animal Heart: Unevolvable, whether Primitive or Complex by IDEA Center. This page was last modified on 15 February 2017, at 13:27.